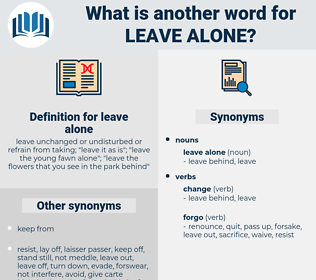 What is another word for leave alone? 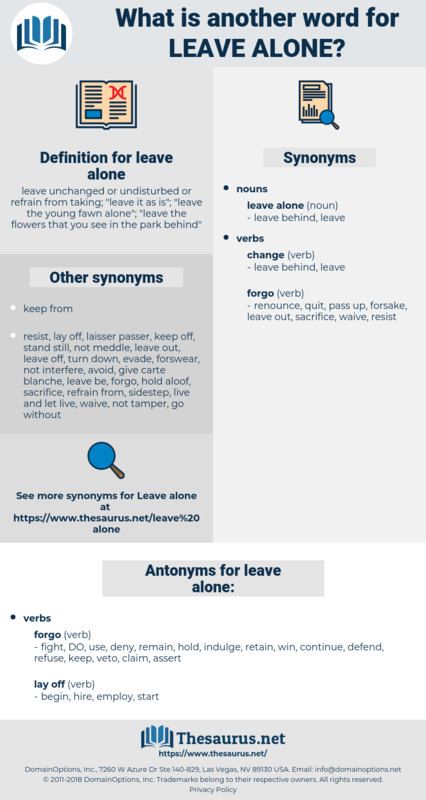 leave unchanged or undisturbed or refrain from taking; " leave it as is"; " leave the young fawn alone"; " leave the flowers that you see in the park behind"
fight, DO, use, deny, remain, hold, indulge, retain, win, continue, defend, refuse, keep, veto, claim, assert. agree, allow, cease, go along, encourage, accept, conform, advance, desert, discontinue, ok, permit, abandon, aid, stop, go, comply, quit, give in, surrender, leave, assist, give up, reject, help. leiophyllum, leiopelma, loop-line, lublin, life line, liopelma, lip balm, love line, lifeline.